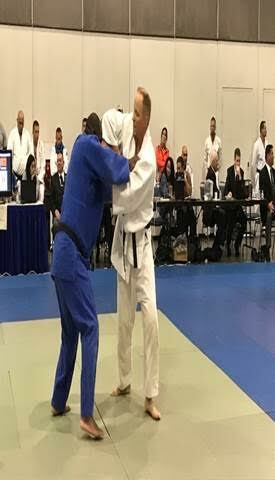 "I started Judo when I was 10 years old in McCall, Idaho and I have been training in the sport ever since," said Deputy Bacon. In 1986, Deputy Bacon was invited to train at the Olympic Training Center in Colorado Springs. There he spent nine years training and was lucky enough to travel and compete in Judo at competitions in Europe, Asia and South America. After his time at the Olympic Training Center, Deputy Bacon was given the opportunity to compete in the World Police and Fire Games. In 2001, Bacon won gold at the games in Indianapolis, he took home the bronze medal during the 2011 games in New York City and in 2015 he took home gold at the games in Fairfax, Virginia. "It was a great experience to win my third gold medal at the World Police and Fire Games. I just turned 54 and to be able to compete, and medal in the sport that I love is a blessing," said Deputy Bacon. In fact, Bacon's love for the sport has given him the opportunity to share his passion with others in the community. "I am a fourth degree black belt and an instructor at Northglenn Judo," said Deputy Bacon. "Having a student tell me I’ve made a positive impact in their lives with Judo is priceless." Deputy Bacon says he is thankful for his partners in the ACSO Patrol Division who he says are incredibly supportive of his Judo competitions. "I value opportunities to share my passion and the benefits of Judo with others," said Deputy Bacon. Congratulations Deputy Bacon on this great achievement!